For the first time in Sri Lanka, a unique Sinhala mobile game was introduced. The game revolves around a taxi based in Colombo. What is unique about this game is that the actual gaming environment depicts an almost identical map of Colombo with focus on the main streets. Talking a bit about the game, the gamer plays the character of a taxi driver. His objective is to earn money by taking hires in an around the Colombo area. What adds value is that the game not only shows the Colombo map, but it also has voice clips in Sinhala guiding the gamer. This not only keeps the user interested, but also it keeps the user entertained. Since it has a real environment of Colombo inside the game, companies in and around Colombo are able to place advertisements in the game. This is a revolutionary marketing approach which from the looks of it, has a direct consumer interest. Mobile phones are seen wherever we go in Sri Lanka. With seven million mobile phone users, it’s a surprise why advertising has not targeted these consumers before. Since the game is available free from the website www.games.lk it not only allows any consumer to have the game, but since there is no mobile network restriction, anybody in any mobile network is able to play this game. Sri Lankans living abroad can also download this game to their mobile phones. The game was developed by GTS (Gamos Technology Solutions - www.gtslk.com), the pioneers of mobile games in Sri Lanka. They are also the creators of the upcoming official mobile game ‘Aba’ which will be released soon. Virtusa Corporation announced that as a part of its Campus Reach Initiative (CRI), fifty-five interns from the University of Colombo School of Computing (UCSC) have successfully completed industrial training at Virtusa recently. Under the CRI, Virtusa partners with universities and academic institutions across a wide range of programs to improve collaboration between academia and industry. The internship programme is offered for a period of six months spanning several tracks-including Application Development, Software Quality Assurance and Business Analysis-across multiple Virtusa departments, ensuring hands-on experience in a diverse work environment. HR Manager - Staffing, Vindya Cumaratunga, said, “The Virtusa internship programme is one of the main objectives that we focus on under our CRI, which completes eleven successful, enriching years. What makes this programme distinct and unique is that we emphasise an internship that is more business-oriented. Not only are the interns educated and trained in their relevant technologies, but they are also provided with the required knowledge to make them ready to face the corporate world,” Cumaratunga said. Annually Virtusa identifies a cluster of students in the UCSC to complete their internships, gaining industry knowledge and global exposure. The purpose of Virtusa’s internship programme is to develop and strengthen undergraduates’ IT education and career preparation. The programme provides the student with a greater understanding of career demands and qualifications. It allows a student to understand the connection between what is studied and how it is applied in business; thus, it enhances the student’s self-knowledge and career potential. Yvonne Dilini Wickramasinghe, a UCSC student and intern, said, “We were quite excited to be selected by Virtusa for our internship programme. At the beginning we got the opportunity to listen to success stories of the company’s tech-savvy experts. Epsi Computers, Authorised distributors for ASUS in Sri Lanka announced the introduction of the Eco friendly ASUS Bamboo notebook in Taiwan. Group Product manager Epsi Computers Sankha Jayaratne, said ASUS has brought forth a new concept line that focuses on alternative material design aimed at helping save the earth. ASUS is committed to green computing, and this new lineup of concept products serves to keep users in touch with the future of environmentally friendly technology. He said this concept series a mix of the old and the new stands for the continuous commitment to bring cutting edge products that are sensational in all senses and forms. With limited resources and ever increasing demand, it is vital that consumers and hardware providers included; strives to protect the environment in every possible way. ASUS’ commitment to green computing has resulted in the research of alternative materials in its production of components and products. With such innovative technologies, ASUS has created an image of the future for computing - showcasing environmentally friendly designs for notebooks, LCDs and Mini PCs with bamboo as an alternative material in the manufacturing process. Jayaratne also said some of these models will be at their showroom in the very near future and also stated that specific models can be imported on special order. PROLiNK launches Gigabit Ethernet Switch that deliver power, performance and reliability in one cost-effective, space-saving design. PROLiNK Gigabit Ethernet Switches provide high network performance to suit different home and business needs. It enables sharing of large data files and images, accessing of real-time information and connecting to high-speed servers or a high-speed network backbone. Featuring auto MDI/MDIX on all ports, PROLiNK Gigabit Ethernet Switches eliminate most common cabling problems. Known for it’s quality and affordability, PROLiNK’s new Gigabit Ethernet Switches automatically find the fastest connection speed.The auto-sensing 10/100/1000 ports capability automatically adjusts to the speed of network devices communicating at 1000, 100, or 10 Mbps. PROLiNK Gigabit Ethernet Switches ensure optimum throughput for bandwidth intensive applications and compatibility, and accommodate a range of workgroup applications. Sala Enterprises is the sole agent for Prolink products in Sri Lanka. Moviegoers worldwide are sure to be delighted by the breakthrough animation achieved through the combination of HP technology and DreamWorks Animation’s creativity as DreamWorks Animation SKG Inc.’s highly anticipated summer movie, Kung Fu Panda, hits theaters. 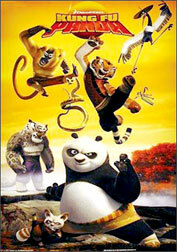 HP also partnered with DreamWorks Animation and Nickelodeon to bring “Kung Fu Panda” to life outside the movie theater in fun, interactive ways, including a HP “The Computer Is Personal Again” TV spot featuring Po the Panda, downloadable activities and crafts, and a choreographed “The Panda” dance that the whole family can learn. “We have been working with HP for years to develop and implement technology that enhances our creativity,” said chief executive officer and director, DreamWorks Animation, Jeffrey Katzenberg. “With the help of HP technology, our animators are now creating movies that were simply impossible to make even last year,” he said. The technology and marketing behind the film is the latest example of the ongoing collaboration between HP and DreamWorks Animation that continuously delivers “the next big thing” in the media and entertainment industry. “HP has always been committed to bringing innovations to market that help all types of customers unleash their creative genius, whether they are high-profile studios or everyday people,” said General Manager, Personal Systems Group, Hewlett-Packard Asia Emerging Countries, Prasenjit Sarkar. “By partnering with other leading consumer brands like Nickelodeon to tell the story of Kung Fu Panda, we can bring DreamWorks Animation’s creativity to life,” he said. 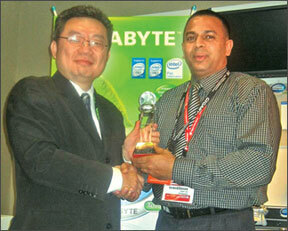 Local IT solutions provider, PCH Holdings, has won the ‘Best Partner 2008’award from its vendor-partner, GIGABYTE United Inc. The award recognises the company’s commitment and outstanding performance in promoting GIGABYTE’s products and for its role in increasing the vendor’s market share across the Sri Lankan market. PC House was rewarded for its leadership, experience, and sales performance. PC House was empowered with rights to market and distribute GIGABYTE branded ICT products such as motherboards, VGA cards, servers, graphics accelerators and desktop platforms. Chairman, PC House (Pvt.) Ltd. S.H.M Rishan said, “Our aim is to be the leader in high growth diversified business portfolios with global presence. We fervently engage in providing quality solutions for our customers”. Plans are underway to occupy a market share of over 50 per cent , making over 15 per cent profits within the next year said Product Manager for Gigabyte, PC House (Pvt.) Ltd Ravindra Jayasinghe. “We need to keep enhancing our service in Colombo and the retail arm together with innovative product expansions backed with top notch customer care, providing a hazard free platform for all our customers,” he said. An ambitious expansion programme is being rolled out to further strengthen all its sales and service avenues including the setting up of 100 branches by end of this year. Recently GIGABYTE together with PC House took the lead to develop responsible computing technologies that have as little impact on the environment as possible. In addition to removing lead and other hazardous materials from their products, GIGABYTE has developed the Dynamic Energy Saver Technology, which delivers unparalleled power savings.